The execution of episode 1 shows that Dontnod Entertainment are unafraid to strike out in this new direction, while learning from the flaws in the first season. It’s October 2016. You are playing as Sean Diaz. A 16 year old Hispanic resident of Seattle, you’re a track star, an artist and a reasonably good kid excited to go to a Halloween party the girl you like is also going to. You’ve got a dorky nine year old brother, Daniel. He’s a kid, he plays Minecraft, has a crush on your best friend Lyla and generally behaves the way a nine year old sibling does. Irritatingly. Your dad is a mechanic, your mum is out of the picture, and life is pretty good for the most part. Needless to say, drama happens, and when a tragedy strikes, Sean and Daniel are forced to leave on a trip across America that will force them both to grow up quickly and learn from each other. 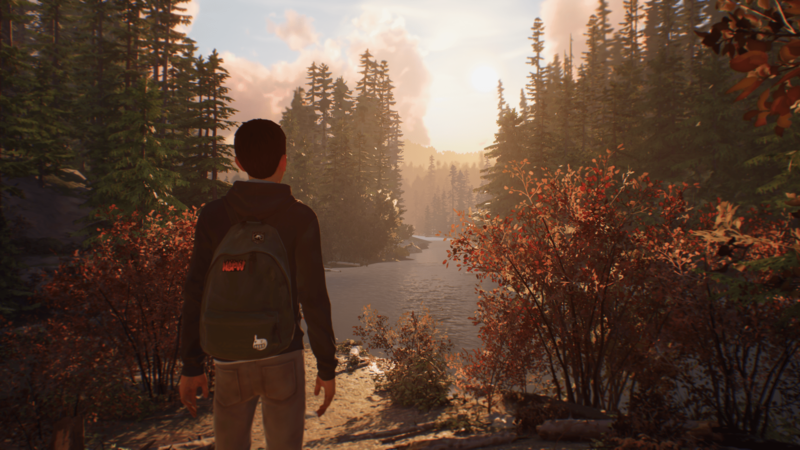 Starting up, Life is Strange 2 is still an adventure game. The core gameplay loop is moving around an area, examining and collecting interactable objects, having conversations and making decisions. As this is Life is Strange, sometimes you’re given the opportunity to stop for a few minutes and let your character listen to pleasant indie music while they ruminate on the current plot. This time, the loss of short Time Travel as a core gameplay mechanic is a noticeable difference, but not an unwelcome one. Rather than exploring the immediate ramifications of your choices, Dontnod instead relies on Daniel as the motivating element in your decisions. Daniel wanders around scenes and comments on whatever is going on. But Sean can also discuss what is happening with him by highlighting objects to ensure he learns things. Daniel tends to go to any interactable in the scene, but there’s an entirely different set of dialogue for Daniel compared to Sean. 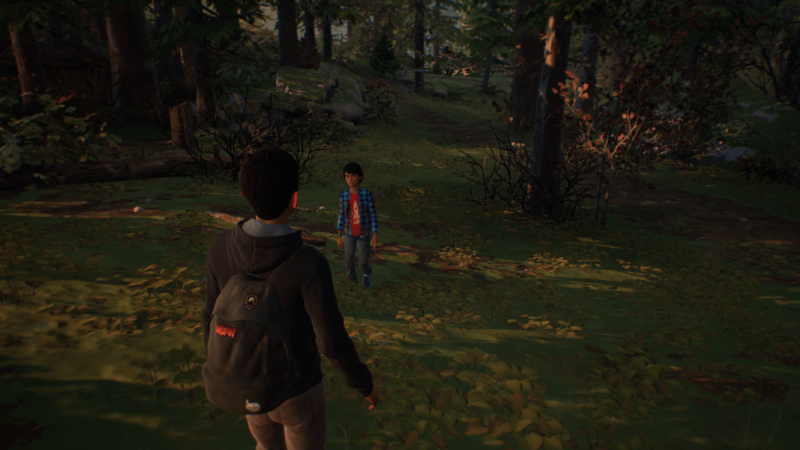 Both in the story and in the gameplay, the key is how Daniel interacts with the world and learns about it. The best way to explain this is in regards to the now genre ubiquitous breakdown of decisions at the end of the episode. Usually these show what percentage of the player base made each decision. 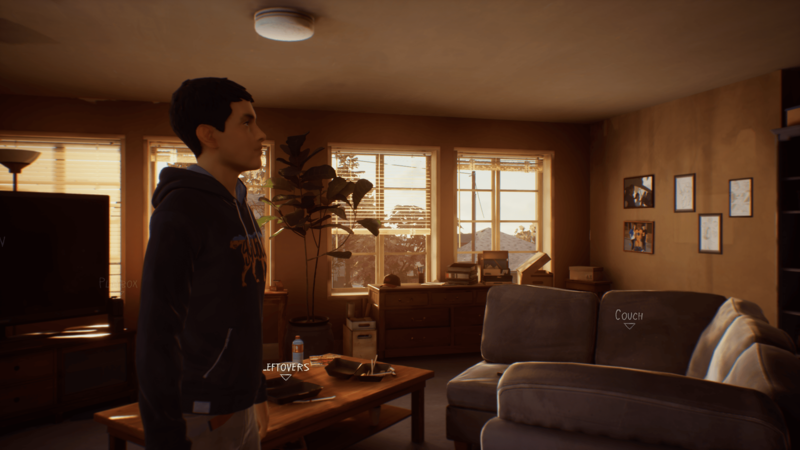 In Life is Strange 2, this focus on teaching Daniel results in the final decision breakdown being explained as how choices affect Sean, and how they affect Daniel. An example late in the episode shows that Daniel is learning from your actions in the story. He will treat people and react based on how Sean engages with the world. It’s an interesting version of the first season’s focus on long term consequences for short term decisions. Decisions mean nothing unless you care about the people and world that you’re affecting though. Sean and Daniel are very different to Max and Chloe, but they’re very well realised. The slightly unreal dialogue was one of the big issues in season 1 that caused people to bounce off the series. Here, it seems to have gotten a lot better. It helps that the Diaz brothers are supposed to be fairly young, so any stilited dialogue or oddness is easier to rationalise as them being kids. How the team achieve characterisation through action is especially impressive here. While every player’s Sean is likely to be interpreted differently through player choices, Sean is given little moments to actually be a character rather than a blank slate. Without player prompting, he sings along under his breath to music. He practices what he’s going to say to impress the girl he likes at a party. As for Daniel, his actions are even more impressive. He’s constantly wandering around the game world, balancing on logs, commenting on posters. Where he could just be an AI follower to be escorted, instead he seems to be an actual supporting character. As for the other characters in this world, character aesthetics and language are used to stellar effect to immediately convey impressions to the player. Really well designed, really well voice acted all round. As for the game world, this is a story firmly grounded in reality, topped off with traditional Life is Strange wierdness. The story is unapologetically political. You’re playing a minority in America in October 2016. The US election campaigns are explicitly referenced and how the Latino protagonists deal with that environment in America is core to their story. It’s telling that the inciting incident for all the drama in the story is literally a racist xenophobic neighbour teen picking on a nine year old. It ends up making the overall decision making significantly more interesting. Ethically, when you’re in an environment that hates you for existing, and you have to protect someone important, what is permitted? So the decision making gameplay is different here from season one, and so are the puzzle mechanics. There’s a lot of world building and scene setting going on in this episode, so there’s only the one traditional puzzle sequence. Its very well designed though, as Sean has to direct Daniel to accomplish actions within the gameworld. It’s set from a fixed perspective where Sean can’t interact, and really makes something new and interesting out of the select object to interact game format. The other change to gameplay is in the inventory system. The game features an increased focus on inventory and item collection. Considering the story format has moved to a road trip, this is appropriate and adds a certain strategic element to the game. You’ve got to keep track of money, and decide when spending is worth it, and when other means of acquiring products is called for. (Read: Stealing) The issue is that you might not want to teach Daniel that stealing is allowed, but you also might want to keep him from starving. It’s an interesting wrinkle in the usual adventure game format, and means that even the collection of items ends up being a considered part of the adventure. Overall though, this is the same core game. 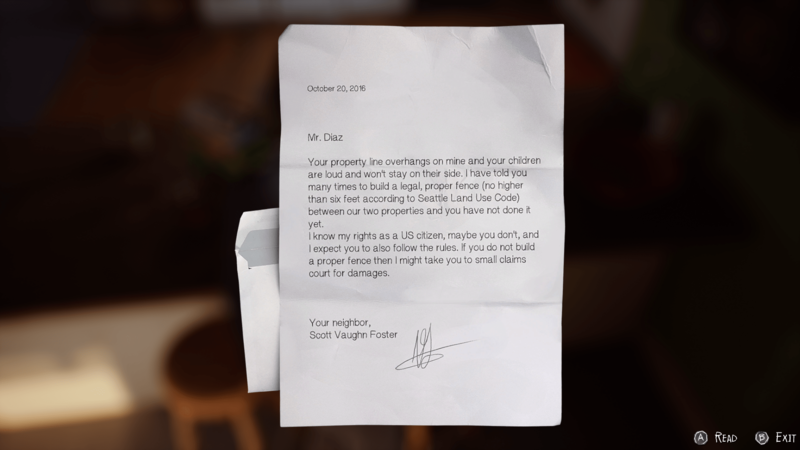 Life is Strange 2 still features lushly designed environments, filled with collectibles and notes to flesh out the world. It still has the beautiful art style, where flat colours mix with gorgeous lighting to create an paintstroke artstyle. Another plaudit should go to the animation team. They’ve done a spectacular job with the movements of Daniel, but also fixing the issues with lip sync and character eyes that were an issue in the first game. The flat shading of the rest of the games art style is contrasted with the eyes of the main characters, especially Daniel. They convey so much of the character, with his eyes having a twinkle that reflects his youth. Rather than the doll like flat orbs of the first game, something about these really captures the “life” of these characters. It’s still the first episode of the season obviously. There’s time for things to go wrong. But this is a (mostly) clean break from the first game. 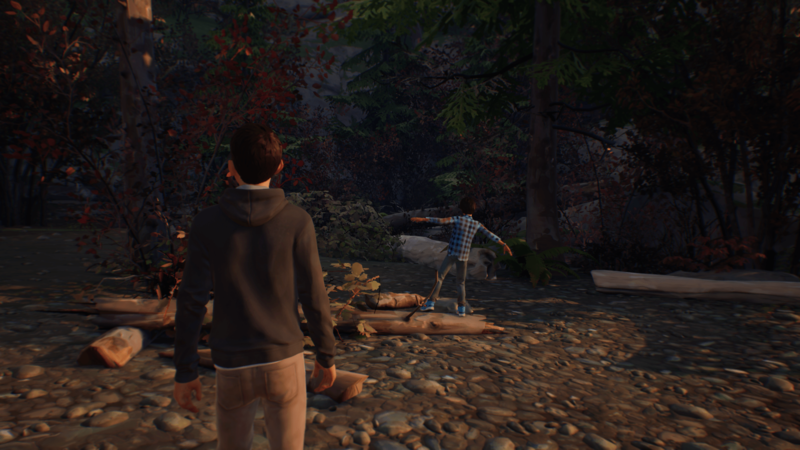 Life is Strange 2 is a significant improvement, and making a statement about the story it wants to tell this time around. It’s hard not to be enthusiastic about that.